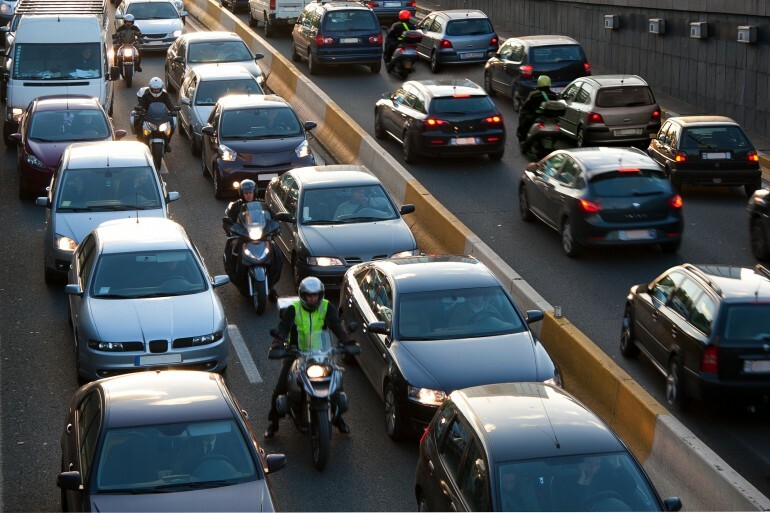 In most of the world, filtering (otherwise known as lane splitting) is not only legal and expected practice by motorbikes, it is often a component of the road test when going through the licencing process. Yet, this practice remains a point of contention with often strong negative opinions in North America where filtering is illegal (outside California). Even in California riders tend to have strong and mixed opinions on the practice, despite studies on the subject which have consistently shown that fewer fatalities occur in areas where filtering is legal or tolerated. I have more than 20,000 miles of inner city London riding under my belt (and many more long distance miles). During this time I would say someone has deliberately attempted to block me or endanger my life at most once every 3–4,000 miles because drivers here tend to understand that motorbikes reduce congestion which therefore shortens journey times for everyone. Having lived and driven in North America extensively, I noticed a much higher level of aggression and road rage by drivers there compared to Europe—as though people are much more reactive to the perception that their rights are being infringed for any number of reasons, not least because another vehicle is able to squeeze through smaller gaps and is therefore able to make progress more quickly. The driving culture is very much ‘me, me, me’—if I can’t go, no one else should be able to go, it’s so unfair, so I’m going to block anyone trying to come through. Even if filtering was made legal across North America tomorrow, until this culture shifts to one of mutual respect, acceptance and understanding, filtering just won’t work in the states and provinces where it is currently banned. It’s not queue-jumping—it’s making full use of available space. Of course, filtering is not carte blanche to ride like a buffoon—it is about moving with caution and prudence at a speed appropriate to the traffic and road conditions. Like most riders in the UK, I won’t filter on the motorway unless speeds have dropped below 40–45mph because common sense dictates that anything faster starts to become an unacceptable risk. And flying by slower or stopped traffic at high speed is a disaster in waiting—again, common sense. I can’t really say it better than this article from Gizmag (follows below). I’d love to hear from readers in North America about why you are for or against joining this practice which works so well in the rest of the world. Recent research has confirmed what many motorcycle riders have known for years. “Lane splitting”—or riding in between lanes of traffic—obviously saves riders a lot of time, but it's also considerably safer than sitting in traffic and acting like a car, as long as it’s done within certain guidelines, and contrary to what many drivers think, it actually speeds up traffic for everyone else on the road. Riders, please pass this information on to the drivers in your lives. It’s time for certain drivers to get these thoughts out of their heads: “lane splitting is queue jumping,” “motorcyclists should have to wait in line like the rest of us,” “riding in between cars is suicidal.” While it’s illegal in most of the United States, it’s accepted in many other parts of the world, and evidence is mounting that lane splitting is safer for riders than sitting in traffic, and actually benefits car drivers as well as the riders themselves. One of the key arguments against lane splitting is that, to many driver’s eyes, it seems like a dangerous practice. From a rider’s perspective, this couldn’t be further from the truth. The most common type of accident on the road is a rear-ender. These make up 40 percent of all accidents in the United States, according to the National Highway Traffic Safety Administration. And while most of these are minor fender benders between car drivers, there’s really no such thing as a minor fender bender if someone slams into the back of a motorcycle. By splitting between lanes, riders are able to put a shell of slow or stopped traffic around their bikes and protect against the inattention of other road users. In a recent Berkeley study undertaken with the California Highway Patrol’s assistance, 7,836 motorcycle crashes were examined closely, with some 1,163 of these crashes having occurred while the rider was lane splitting. Riders who were splitting at the time of their accident were significantly less likely to be injured in every category than those who weren’t: 45 percent fewer head injuries, 21 percent fewer neck injuries, 32 percent fewer torso injuries, 12 percent fewer arm/leg injuries, and 55 percent fewer fatalities. This is quite possibly because the majority of those splitting accidents happened at speeds between 1 and 30 mph (50 km/h). The data also shows that the safest way to lane split is to travel at less than 30 mph, and less than 10 mph above the speed of the surrounding traffic. Injury rates leap up in all categories when both of these conditions are violated. Lane splitting is an unspoken contract between riders and drivers. Riders don’t wait for stopped cars, and in return, they don’t make the cars wait for them. Where many drivers get it wrong is that they see lane splitting as "queue jumping" that will cause each car to go one further spot back in the queue. In truth, a filtering bike disappears from the queue altogether, the only time a motorcycle holds a car up is when it sits in traffic and acts like another car.